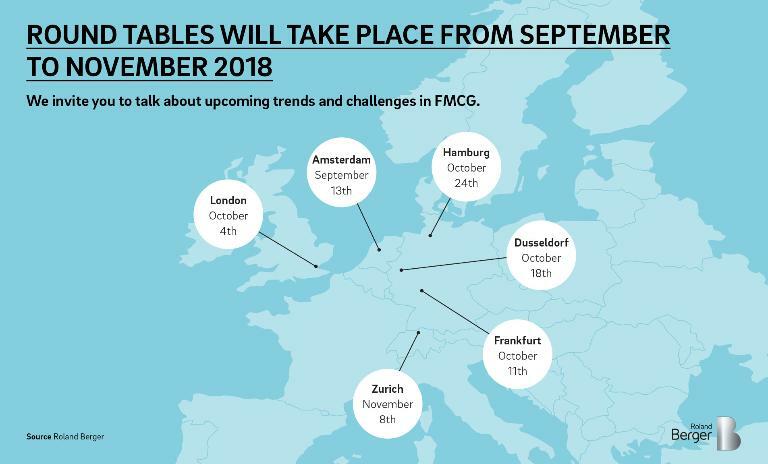 This autumn the Roland Berger Consumer Goods & Retail Team will host round tables in a number of key European cities. Learn about the latest trends and challenges the sector is facing, guided by insights from the recent Consumer Goods Forum Global Summit, held in June in Singapore. 1. Casper Meijer, former CEO, Blokker, on "Disruption in Retail"
Amsterdam, September 13: Casper Meijer has 30 years of experience in the FMCG and retail industry, working for companies such as Unilever, Ahold, Albert Heijn and Morrison. From October 2015 until 2018 he was Chief Executive Officer of Blokker Holding, where he supervised the online and digitization process. 2. Marc Oosterhoudt, Chief Commercial Officer, Sjoprz, on "The Future of Grocery Shopping"
Amsterdam, September 13: Marc Oosterhoudt was founder and MD of B-motion Entertainment BV in Amsterdam, as well as founder and MD of Eastwood Interactive Marketing Co. Ltd. in China (Shanghai). He worked at FrieslandCampina, Nestlé, MeadJohnson, PernodRicard and Heineken. Since April 2018 he is CCO at Sjoprz (pronounced 'shoppers'), a groceries comparison site becoming marketplace. 3. Ronny Gottschlich, former CEO, Lidl UK on "Retail Fast and Slow"
London, October 4, 2018: Ronny Gottschlich has been working in the UK, one of the most competitive and fast developing retail markets, since 2003, first as a Regional Director and from autumn 2010 as the CEO for all Lidl UK operations. He helped turn Lidl into a viable British household shopping destination. In 2017, he went on to found Heunadel Retail Advisory, a platform that helps retailers become smarter and more relevant to their customers. 4. Frank Michael Mros, former CEO, Lidl Germany, on "Current Developments in Trade and Discount in Europe"
Frankfurt, October 11: Frank Michael Mros started at Lidl as Regional Managing Director in Berlin. He then joined the Executive Board in Germany and established the Lidl organization in Poland as Country Manager. He was Country Manager in Germany and Lidl UK before he started working as retail consultant for Focus CEE and Russia. 5. Felix Plog, Co-Founder foodpanda, Advisor, Investor, on "Disrupting the Food Service Industry"
Dusseldorf, October 18: Felix Plog has worked in the technology sector as a company founder and managing director for more than 10 years. He established the foodpanda group, the leading food delivery service for emerging markets, and sold it 2016 to Delivery Hero. 6. Bertrand Parizot, Director Buying & Private Label, Amorelie, on "Get your Customers where they are – Navigating Omni-Channel Strategies"
Dusseldorf, October 18: Bertrand Parizot worked for Roland Berger after having held various managing positions in Strategy, Sales and Product Development for Bombardier Transportation and Aerospace. Today, Bertrand is part of the management team of Amorelie, where he develops the portfolio of Love & Lifestyle products that the company is buying, producing and selling online as well as offline. 7. Lars Luck, Vice President Direct-to-Consumer Business, WMF / Groupe SEM, on "Opportunities and Challenges in the Direct-to-Consumer Business"
Hamburg, October 24: Lars Luck worked for Roland Berger for 14 years, most recently as Partner in the Competence Center Consumer Goods & Retail / Marketing & Sales. 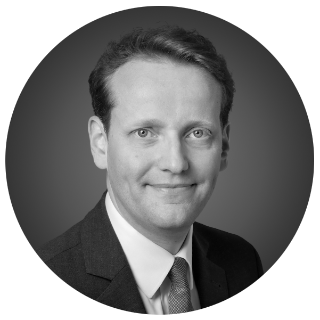 He worked three years as Head of Corporate Strategy at Metro Group and then joined Groupe SEB in 2017, initially as Vice President for Integration and Strategy at WMF, then as Director DTC. 8. Christian Gieselmann, Chief Financial Officer, Warsteiner Group, on the "Warsteiner Future Program"
Hamburg, October 24: Christian Gieselmann has 21 years of professional experience in the fast-moving consumer goods industry, thereof seven years in management - Managing Director Chocolaterie Gieselmann, COO Lieken AG (BarillaGroup) - and 14 years in consulting. 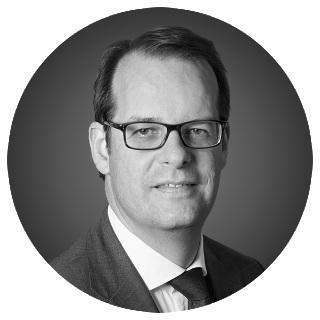 He was Partner at Roland Berger and delivery manager of the project „Future Program“ for the Warsteiner Group, where he has been CFO since March 2018. 9. Alessandra Cama, Managing Director Sales and Marketing, Warsteiner Group, on the "Warsteiner Future Program"
Hamburg, October 24: Alessandra Cama, an established expert in the consumer goods and retail industry, has been Managing Director Sales and Marketing at Warsteiner Group since October 2017. Previously, she was a member of the executive board at GfK and a Partner at Roland Berger, focusing on consumer goods and retail companies. She's also held management roles at, among others, Barilla, Unilever and Johnson & Johnson. 10. Christian Köhler, Managing Director, Markenverband, on "Brand Thinking in Reaction to External Factors"
Hamburg, October 24: Christian Köhler heads the Brands Association (Markenverband) in Germany, which represents the interests of brand-oriented businesses (goods and services) in Brussels and in Berlin. 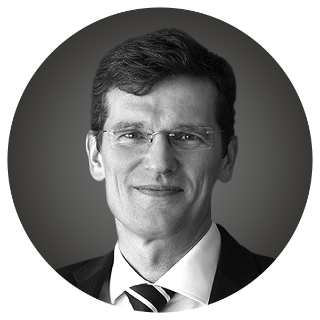 He also serves on the supervisory and advisory boards of several European food, chemical and services companies. Previously, he held top management roles in the European food and retail industry, e.g. he led the global food business of Tchibo, the European artisan bakery business of CSM BakeMark and headed Kraft Foods in Germany. Prior to this, Christian worked in various functions with the Mars Inc. Pet food and Food division, which he joined after having worked as an industry consultant. 11. Stefan Hoffmann, Industry Lead CPG and Sports, Google, on "Marketing in the Age of Assistance"
Hamburg, October 24 and Zurich, November 8: Stefan Hoffmann has been with Google since 2014. He is digital expert and industry lead for Branding, CPG and Sports clients, helping them reach their business, marketing and communication goals and facilitating their digital transformation. Previously he held positions as senior marketing executive with 15+ years FMCG experience across multiple geographies, categories and brands at global multinationals such as Unilever, Colgate and Wella. 12. Henning von Einsiedel, Chief Operating Officer, Holy Fashion Group, on "Digitalization of the Holy Fashion Group Value Chain"
Zurich, November 8: Henning von Einsiedel has been Chief Operating Officer of Holy Fashion Group – which includes the Strellson, Joop! and Windsor brands – for more than four years. He is responsible for Product Development, Procurement, Production, IT, Logistics, Supply Chain Management and the digital transformation of the Holy Fashion Group. The previous 3.5 years he was CFO/COO of Orsay, a member of the Mulliez Family Association. Prior to this, he worked for seven years for Roland Berger, in Consumer Goods & Retail. The exclusive Roland Berger round tables, limited to 20 participants per event, are unique opportunities to meet and network with leading industry experts. Renowned speakers from some of the most prominent consumer goods companies will combine with Roland Berger experts to share their in-depth knowledge of the sector, providing an ideal backdrop to help you flourish in today's fast-paced digital environment. The rise of millennials is one of the biggest trends of our time. This digital-savvy generation of consumers takes a completely different approach to shopping. The emphasis is on quality, immediacy and transparency, combined with a low tolerance for mistakes or deficiencies. That's where data comes in – to better understand the consumer and to individualize products and services. But data on its own isn't of much use. We help consumer goods producers turn Big Data into Smart Data, which can be better analyzed and turned into new offerings and digital business models. One reason why the consumer goods industry is increasingly turning to Asia is that large parts of the region are now digitally more advanced than both Europe and the US. And that’s mainly due to local players, not the large multinational chains, many of which are struggling to gain traction in the region. Here's where we find best practices and benchmarks for our clients, particularly with regard to check out, store design, brand staging, customization and omnichannel. This brings us to the next challenge for consumer goods producers: how to establish truly global brands? Ones that are not only universally loved but also 'captains' within their category. The main questions for us are: How much do you need to invest to gain a certain amount of market share? And how elastic are the target markets? There's the additional challenge for smaller and medium-sized players that we help solve: surviving in what's rapidly becoming a game of giants. Innovation remains key for consumer goods producers, to create sustainable customer pull and to present retail with new marketing strategies. However, innovation cycles are actually slowing in most markets. Frequently, what's sold as innovation is nothing more than a line extension, clone or different flavor. Rather than innovating for innovation's sake, we look at targeted investments, offering portfolio benchmarking and modelling of innovation plans. Last but not least, one of the hottest topics for many manufacturers is should they seek to open direct channels to consumers and how would they do it without threatening retail relations and distribution networks? Online shops, digital subscriptions and platform strategies are just some of the models producers are testing and developing. At this point, the dated multi-stage sales process via retail still dominates in the industry. We help determine if a direct-to-consumer model makes sense and how this can best be established.